Probably because I'd been listening to some Acid Techno earlier in the week, I woke up this morning with the urge to play with a 303. So the obvious thing to do was to dig out ReBirth RB-338 and run it through Reason. I was eventually able to get them working together on my computer (which runs Windows 7) but it took a few hours and its not easy, as the required information is all over the internet, not in one place. Next time I reinstall my computer I'll probably have to go through this all over again so I've made some notes which hopefully will also be of assistance to others. One important thing to note is that this procedure will not work with Reason version 8.2 or higher because Propellerheads have abandoned the 32-bit version of Reason. If you have Reason 8.2 then you will have to either side-install 8.1 (as 8.2 and 8.1 may be able to co-exist) or downgrade to 8.1 in order to use ReBirth. I haven't tried it so I don't know for sure, but I would expect that any songs created in 8.2 would not open in 8.1. You may need to use bittorrent to download some files if the Rebirth Museum website is offline- I recommend an open source client like Deluge as some of the past favourites like uTorrent have really gone down the pan lately. ReBirth is an old application from long before the 64-bit days. It seems that 64-bit Reason will only talk view ReWire to 64-bit applications, so if you have Reason 6 or later (which are 64-bit by default) then you will need to install the 32-bit version of Reason. Its possible to do this side-by-side with your existing 64-bit version, without uninstalling it. Reason 8.2 or higher only comes in a 64-bit version, so you cannot use any later version of Reason after 8.1 in conjunction with ReBirth. To install 32-bit Reason you need to start the installer with the parameter "/32". You can do this by running cmd.exe or you can do this with a shortcut. I'll show you how to do this with a shortcut. Download the reason installer from the account section of the propellerhead website. (If you have the original CD then you can skip downloading and adjust these instructions appropriately). The installation files should be in a .zip file, you will need to extract these to a folder somewhere (right-click on the .zip file and select "Extract All..."). 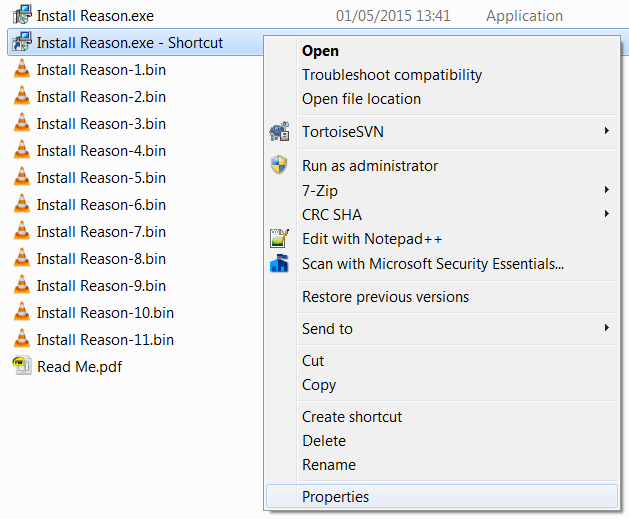 Browse to the folder that you extracted the images to, right-click on the .exe and select "Create Shortcut". Edit the shortcut by right-clicking and selecting properties. In the target box, add the parameter " /32" (without the quotes) to the very end of the line then select OK. 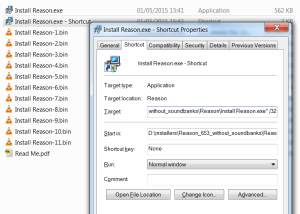 If you launch the shortcut now, the installer will install the 32-bit version of Reason instead of the usual 64-bit version. Remember, Reason 8.2 and higher no longer support 32-bit installations so you must be using a version of Reason less than this. 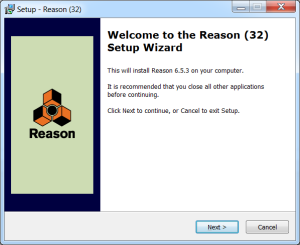 You can verify that everything has gone ok so far, as the installer window that comes up will offer to install "Reason (32)", instead of the usual "Reason". 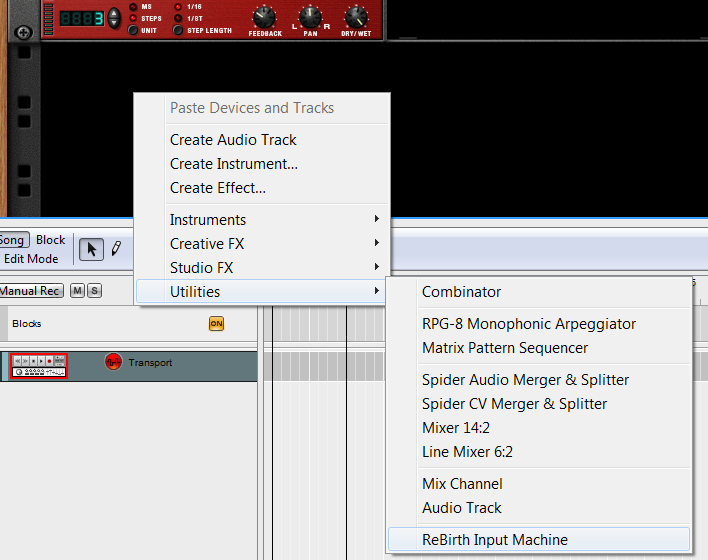 Its possible to have both the 64-bit and 32-bit versions of reason installed simultaneously. 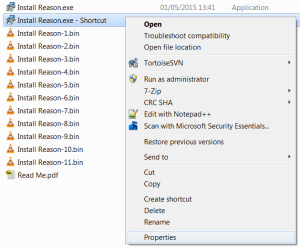 Make sure that any shortcut you use to start Reason is starting the correct version - in Reason 6.5.3, both the 32-bit and 64-bit shortcuts in the start menu are given the name Reason, so its hard to distinguish between the two! 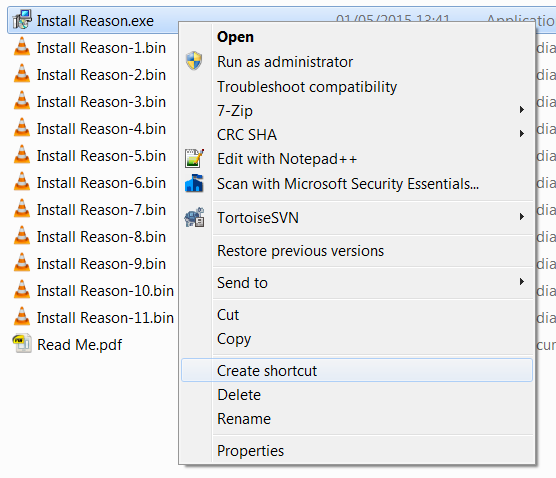 You can check the shortcut you are using launches the correct version of Reason by verifying the installed directory - 32-bit Reason will install into a directory within "C:\Program Files (x86)\", while the 64-bit Reason will instal into "C:\Program Files\". 32-bit reason shortcut is on the left - notice the (x86)! I've based this section on a 5 year old guide over at gearslutz, however some of the information is out of date. Propellerhead have discontinued ReBirth (on computers at least - they have recently brought out an iPad App which you cannot use with Reason). However all is not lost, as they have released the original ReBirth as unsupported freeware. They have created an archive website called the ReBirth Museum where you can download ReBirth and get access to various mods that people have made for the programme over the last couple of decades. Unfortunately, at the time of writing, the Rebirth Museum is down. Part of the website has been archived at The Wayback Machine however you need to register in order to download the ReBirth installer which means that archive.org can't help us. So we'll have to use bittorrent to download the necessary files. Maybe by the time you read this the ReBirth Museum will be back online, in which case you may be able to skip some of this section. Firstly you need to retrieve an image of the rebirth cd. This is available via a bittorrent magnet link or you may be able to find it via google by searching for "rebirth_iso_installation.iso" or "rebirth_iso_installation.zip". However there are a vast number of questionable sites purporting to provide a .torrent but instead providing suspicious .exe files so I highly recommend using the magnet link to avoid all that nonsense. If noone is seeding the first torrent, I also found a second torrent. If you're not sure which bittorrent client to use, I recommend an open source one like Deluge - some of the closed source clients are full of dodgy adverts. Once you have the .iso file you may either burn it onto a CD or use some virtual cd drive software to mount it as a new drive letter. I recommend the second option as having to find and insert a CD to use a piece of software is rather inconvenient. I used Virtual CloneDrive which is freeware. 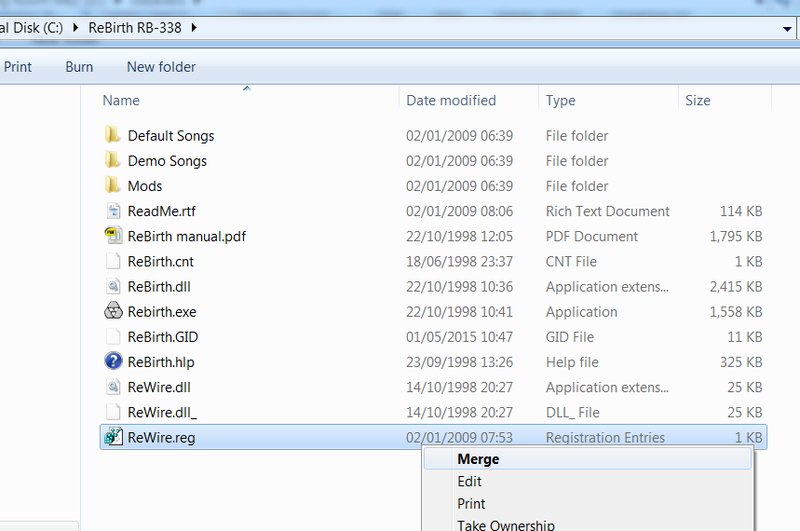 Insert the burnt CD, or mount the iso in CloneDrive as you will need this when you launch ReBirth. There is an installer on the CD however this doesn't work with 64-bit windows so you will need an alternative. Some kind chap has made a 64-bit compatible installer which you can find at sendspace, or via bittorrent. The 64-bit installer will place ReBirth into a fixed location: for me it was "C:\ReBirth RB-338\". Once it has finished running you must navigate to this directory and perform a few actions before you run ReBirth. Firstly, you may need to rename ReBirth.dll_ to ReBirth.dll and ReWire.dll_ to ReWire.dll. If either or both of those dlls are already suffixed with .dll this is ok, you've saved a bit of effort. Secondly you must acquire WinHlp32.exe. For Windows 7 try https://www.microsoft.com/en-us/download/details.aspx?id=91 and for Windows 8 try https://www.microsoft.com/en-us/download/details.aspx?id=35449. If you have no joy with those links, try searching Microsoft's website for WinHlp32.exe. If you have problems installing the file, have a look at section 2.3 of the gearslutz guide for some troubleshooting tips. The final step to get ReBirth working with Reason is to configure ReWire. The installer didn't do this for me automatically, so I had to Merge the ReWire.reg file which exists in the ReBirth folder. Until I merged this file, I would get an error when adding the ReBirth instrument to Reason: "ReBirth not found / Could not load ReBirth Engine / Make sure ReBirth is properly installed". At this point you should be able to launch ReBirth. Press play and you should be able to hear the default tune. 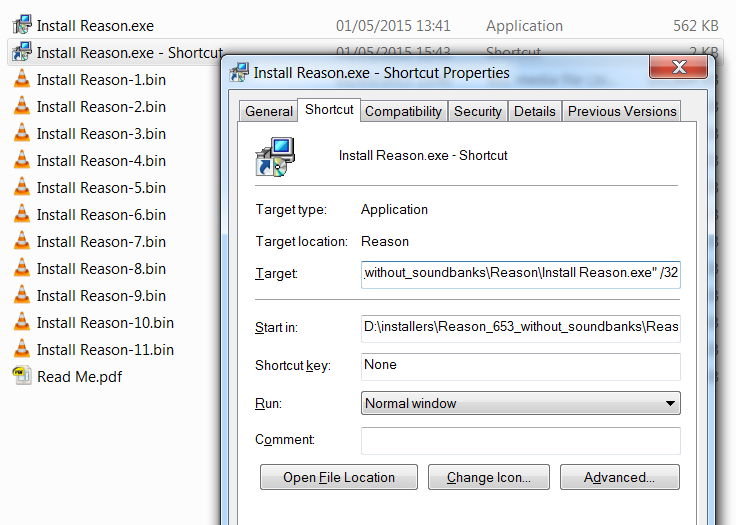 If that worked OK then you should be able to launch the 32-bit version of Reason and add a ReBirth Input Machine. If its working correctly both green lights will be on, so wire up the instrument into the Mixer and pressing play in Reason. You should hear ReBirth's default tune playing again, but this time via Reason! Both green lights will be on if its working correctly. hi , I have rebirth working and have installed reason 7 as 32 bit , I no longer get an error when I insert a rebirth input machine but it still wont link ???? I think it works best if you start Reason first, then RB-338 afterwards. After you start Reason but before you have RB-338 running both LEDs on the Rebirth input machine should be lit. Then when you start RB-338 it should just work. hoping someone will be able to help me out. Installed rebirth after and winhlp32 but when I start rebirth it crashes after the benchmark box. I can run the benchmark fine but when I click to close it out the rebirth window disappeas and I get a window for windows help?? I have tried running the installer again and tried removing winhlp32 but still it won´t work. Any help that would get it running would be greatly appreciated! Thank you for the quick reply! I figured out what it was! It was KB3000850 that broke Winhlp32. So I uninstalled the KB from windows updates and got Rebirth running fine. Now however I have another problem and that is that Rewire doesn´t seem to work as it should. Reason recognizes that Rebirth is installed and I can add the module in reason and create a track but the "active" light does not come on as it should and Reasons sequencer does not control Rebirth. I am running Windows 8.1 64-bit, latest Win updates except for the KB that broke Winhlp32. That active light is key but I've found it to be a little flakey - sometimes it doesn't come on and its not clear why. Restarting reason without RB-338 running has got it working for me. The light comes on even without RB-338 running, and when the light is on, I can start RB-338 and it will work every time. Got it working finally by creating a new song and then reopening the song I was working. It seems a little flakey, like you say, but now I at least have a trick to use to get it started. Thanks for your help and happy producing! Thanks man, you're a life saver. Unfortunately ron's suggestion didnt work for me on win10 x64. (as of jan '16). on closer inspection the script provided by komeil was failing during icacls, so I simply took ownership and applied full permissions to win32hlp.exe and win32hlp.exe.mui in the windows directory using explorer. I really appreciate your putting up the site to help people like us to not only locate, but to also get rebirth going. I am running reason essentials (2.1.1), will this beauty (rebirth) work with essentials? or do I have to get the full version? I can upgrade to reason, if I really need to. Hafler trm8 monitors with Hafler trm10s Sub. I am happy with the setup, but as I have mentioned I really need to be able to create the squelchy bass. Your assistance has already exceeded my expectations, any more would be awesome! I'm not sure if Essentials comes with the instrument you need. You can see the instrument at the bottom of the rack in the following video https://youtu.be/8VF6qepN3Tk?t=183 - excuse the russian, that's the first video I could find that showed the instrument! If you can add that instrument to Essentials then you can hook it up to RB-338. for me. I just edited the text as I said and then it worked. sorry if u cant get it working but hopefully you get it going soon. If anyone can help me I'd go insane with happiness. 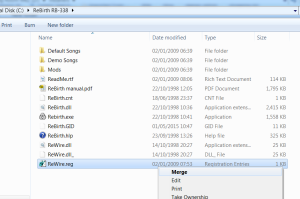 I have many rebirth song files I've written over the years that I'd like to use for production now, but my Rebirth installation CD was lost many moons ago. To my amazement I found a torrent of it, and also an installer for 64bit windows 8.1. I got it up and running and was able to load and work on my tracks! And then I that's when I noticed, "Export Lopp as Audio File" is grayed out. It appears I have a Demo copy of Rebirth. Can anyone direct me to a full torrent, or a way to enabled full functionality in my copy? I am just so angry at Propellerheads for not keeping this available for everyone who wants it.. There are a couple of torrent links in this article which should be the full version. Thank You for excellently clear instructions to install Rebirth, perfect! I can twiddle cutoff and resonance all day! 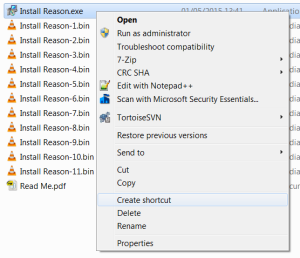 if anyone is having problems installing rebirth there is a packaged rar file with everything from Windows 7-Windows 10 32bit and 64bit installation files. Worked fine for me. Very straight forward easy to use. Is there any mod out there which enlarges the user interface/GUI? There are lots of mods which change the basic appearance of the modules, but not their actual SIZE. The problem is that on my very large monitor running at a high resolution... its @*(#$& TINY. the knobs are smaller than the mouse pointer. Any thoughts? I appreciate anything. I know this is an obscure issue and i was surprised to have found such a recent conversation on the subject. if you are just running rebirth and not connecting to it you could try using a virtual machine to run rebirth, then you could control the resolution? to host it and then grab a copy of windows XP image and fire it up and install rebirth. I've been using this to PLay retro games like Settlers 2 and Total Annihilation. Rebirth is old. The Mods just give you different sounds but no bigger GUI. Propellerhead / Roland For Life !! don't tell anyone this but I LOVE YOU MAN!!! i could use it after having found the installer for Win 7 64 bit and the HELP window files found on the facebook page of rebirth!!! but: is it possible to get it FULLSCREEN???? in order not to kill my eyes? winhelp32.zip (unzipped) on the Harddisk. administrator : Install.cmd. Now start Rebirth, it will run ! Only problem is... when I download the WinHlp update patch from your link, which is in .msu format, and try to modify it as described in the above quote, it just gives me a bunch of gibberish when I open it in Notepad. How do I "unzip" it??? It can't be unzipped! Please help, i don't know if this site is active anymore, but if it is, then please tell me how it works!!! Use a search engine to look for info about extracting/expanding an msu file - there's probably a .inf file in there, which would be the one that the commenter was talking about editing. in Ableton, but when I start Rebirth is mentions something about Cubase? Anyways, I'll take it working on windows 10 as it's progress. The hardest part was locating the winhlep32 file online in 2018. 1. Unzip win32 zip file. to the setting, and save. Right click / Run as admin. Worked right away right out of the gate. and borrow the information of my site and the facebook rebirth group, thanks for that !